The trouble with the Apple MacBook Air is that you can run out of storage quickly once you start making home videos and taking lots of photos. The best answer is to do a MacBook Air SSD upgrade at home. Of course, you can store your media on external drives, but who likes their data scattered around? It’s much easier for regular people to handle their photos, video, and documents on one main drive — and that brings us right back to a MacBook Air SSD upgrade. Can You Do a MacBook Air SSD Upgrade? Basically, you have two good choices of manufacturers now, OWC and Transcend. You can buy direct from OWC or get Transcend’s kits from Amazon. Transcend’s new JetDrive 500 and 520 MacBook Air SSD upgrade kits come with the tools you need, including a handy enclosure for your old drive. 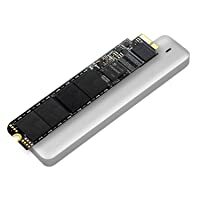 As of right now, OWC is the only manufacturer who has created a Mid 2013, 2014, or 2015 MacBook Air SSD upgrade option in the form of a traditional internal solid-state drive. This was a pretty cool feat of engineering, and it means that you can upgrade up to 1 TB of storage in your MacBook Air. If you’re backing up your iPhone 7 . . . or a family of iPhones, having more onboard storage on your MacBook Air is a great way to manage all this. Note: What if you don’t want to open your MacBook Air case? The TarDisk Pear system is a tiny drive that you can combine with your built-in drive to create a single “fused” storage system on your MacBook Air or Pro. Don’t despair, you have two cool options, both of which are tiny flash-based drives in the shape of camera memory cards. They plug into the SDXC card slot on your 13-inch MacBook Air. For all intents and purposes, the Transcend JetDrive Lite acts like a little USB thumb drive — but it fits flush into the SDXC card slot instead and appears on your Mac like an external drive that is always on, always available. It appears as a separate storage option to your Mac’s operating system. Quite handy. The TarDisk Pear system, on the other hand, also uses the SDXC card slot but it combines with your built-in storage to form a single “fused” drive. If you want a near-permanent — but easy storage solution for your MacBook Air — the TarDisk Pear system might be your best bet. Moving on, back to the traditional SSD replacement process. . . .
After you watch the guides, if all this seems too risky or scary for your skills and personality, find a buddy who has done it before — or have your local computer store do it for you. OWC is the only MacBook Air SSD upgrade manufacturer that has a traditional internal SDD replacement for today’s newer Mid-2013, 2014, or 2015 MacBook Air models. The data cloning process might take a couple of hours, but the actual MacBook Air SSD upgrade installation should take less than 30 minutes, even for newbies. Just make sure that you’re in a relatively stable and clean environment, and if you’re really worried about frying your system with static electricity, consider buying an anti-static mat. Personally, I’ve never bothered. Call me reckless and proceed at your own risk. Last of all, go slow. Place the tiny little screws in a bowl so they don’t roll off your desk and get lost in your carpet. What’s Next? Enjoy your new storage capacity and congratulate yourself on extending the life of your MacBook Air. Plus, now you have a handy external portable hard drive.